Wheel of Spirit. Wheel of Wisdom. Part One. As we step back into an exploration of the Oran Mór, the Great Song of Ireland, I will begin by sharing a story from Irish mythic history, The Settling of the Manor of Tara. A story that calls to be told in three parts. Many have written and shared this story, my favorite is the following which is excerpted and adapted from Frank MacEowen’s book The Celtic Way of Seeing: Meditations on the Irish Spirit Wheel, a book and author I highly recommend. A voice rumbled from deep within the empty hall. The two men looked at one another and knew something was amiss. They had felt a disturbance in the Great Peace for quite some time and had noticed the seeds of chaos beginning to sprout. The usual harmony of the land and of their souls had gradually entered a troubled state. 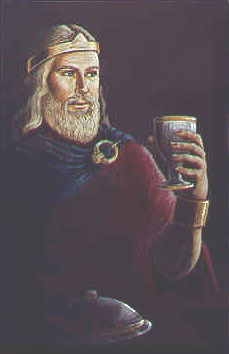 It had always been the custom for the nobles of Ireland from the far reaches of the island – lesser kings and chieftains alike – to travel every three years to the Great Hall at Tara: to sit in council, swear fealty to the High King, to attend a banquet in his honor, and then to aid in giving a grand feast to the Irish people over several days of celebration. It was an ancient observance, and ancient feast that involved music, storytelling, foot races, horse races, jousting, as well as the announcement of marriages, all against a backdrop of ale drinking and lovers courting. The Great Feast was a way to honor the bounty of the land, to remit the bond between the High King and the land, and to maintain the memory of who they were. The nobles had traveled to the Hill of Tara. They had gathered. Yet they had not entered the king’s fortress, or the Great Hall. Instead they stood with each other discussing a troubling matter. “I do not understand why Diarmid, son of Cerball, has taken such a large measure of land for himself,” one chieftain announced. After much discussion, the chieftains and nobles realized they were divided on the matter of whether the Great Feast should proceed according to plan. With that, the nobles and chieftains decided to send someone up to the main gates of the Great Hall at Tara to convey their message. This entry was posted in Uncategorized and tagged In Relationship With The Sacred, Sacred Wheels & Hoops by judithnilan. Bookmark the permalink.